Heilongjiang Provincial Art Museum is the officialMuseum of Fine Arts which has the following functions, collection, research, exhibition, exhibitions,public education, cultural exchanges and artisticservices. Heilongjiang Provincial Art Museum is a permanent national cause of public cultural institutions which is open free to the public. Heilongjiang Provincial Art Museum was founded in1962, which, after five years of development and improvement, has the following establishments,Edition Art Academy of Heilongjiang Province, Heilongjiang Academy of Fine Arts Creation,collection department, exhibition & display department, theoretical research department, the Ministry of Public Education, the Academic Committee original Printmaking Base in Heilongjiang and other professional sectors. At present there are 40 formal staffs, including 10 staffs of senior professional titles, 10 staffs of associate senior professional titles, more than 5,300 pieces of the collection of art works. Heilongjiang Provincial Art Museum is located in the Daoli Lot Street No. 97 which has a total construction area of 3,000 square meters, and exhibition area of 1,000 square meters. Heilongjiang Provincial Art Museum has the following aims : adhere to the public welfare and public promotion of ethnic culture, spread advanced culture, Inheritance of Regional Culture; protect local artistic achievements, to promote contemporary art creation, improve the public aesthetic quality and promote domestic and international artistic exchanges; strengthen Fine Arts Museum’s status and role in the public cultural service system, promote great development and prosperity for Heilongjiang culture and the arts. Heilongjiang Provincial Art Museum collects and exhibits Heilongjiang membership artists’ works and artifacts, documents that reflect the development of the Heilongjiang Provincial Academy of Fine Modern and important art activities in Heilongjiang Province. Heilongjiang Provincial Art Museum also collects and exhibits domestic and international works and literature of Art schools that have an important impact as well as creation of contemporary Art and the representative achievements of Art Research. Therefore gradually establish the system for art collections, exhibitions on display, and academic research, the aesthetic education and cultural service which reflect the development level of contemporary art and the Heilongjiang Academy of Fine Construction of Great, thus built the important place as well as the national major fine arts venues where spreading human civilization, promoting advanced culture, and shaping the human spirit as all. Before the mid-1980s, Heilongjiang Province Art Museum was once one of the early built Provincial Museum of Art with larger scale, relatively leading professional facilities and level of activity. Under the leadership and care of the Provincial Party Committee, Provincial Government, Provincial Propaganda Department and Literary Federation Heilongjiang Province Art Museum made efforts to service for the construction of culture and art, and enrich the people of the province's social and cultural life in the classic collection of fine art. In space of theoretical research, boutique creation, exhibition, educational outreach, and internal and external communications, Heilongjiang Province Art Museum played a huge role, made a significant contribution to the prosperity and development of culture and the arts in Heilongjiang Province. Since the construction of Heilongjiang Provincial Art Museum completed, it successfully held, hosted hundreds of large-scale art activities including national arts activities and made frequent exchanges of foreign art. 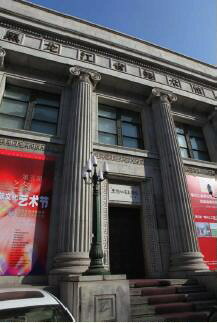 In recent years, according to the geographical and cultural characteristics, Heilongjiang Provincial Art Museum actively built the diversified and interactive platform, formatted volunteers team, held many Exhibitions such as Chinese Contemporary Art Exhibition, Chinese Contemporary Printmaking Exhibition, National Touring Exhibition of the Collection of Works, International Art Invitational Exhibition, Heilongjiang, Jiangsu, Anhui, Guizhou and Guangdong Five Provinces’ Contemporary Printmaking Exhibition, International Art Exchange Exhibition, and a variety of academic seminar., Heilongjiang Provincial Art Museum efforts to broaden the promotional channels for exhibition, collection, public education and exchange based on geographical aesthetic research. At the same time, Heilongjiang Provincial Art Museum gives enough cultural concerns and theoretical exploration of Heilongjiang, China and the international contemporary art development.